Council members toured recently acquired lands in the Homecamp Area. At Boulder Reservoir and Divine Springs they discussed proposed recreation site improvement projects. They also discussed proposed grazing management strategies. The lands were acquired through the Southern Nevada Public Lands Management Act. Vice Chairman Skip Willmore convened the meeting at 8 a.m.
Category Two: Frank Bayham, Judy Oliver, Louise Jensen, Gale Dupree, Alan Cain. Category Three: Brad Hansen, Sean Curtis, Carol Montgomery. Absent: Nancy Huffman, Jim Chapman. Guests: Jackie McGarva, Likely; Carla Bowers, Volcano. Vice Chair Skip Willmore chaired the meeting in Nancy’s absence. Approvals: The agenda for this meeting was approved. 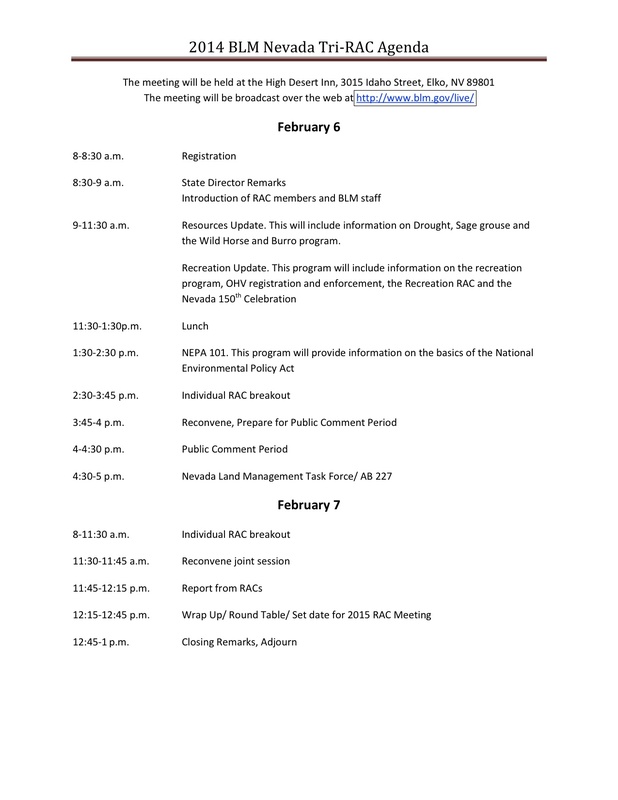 The minutes from the February meeting were approved. should be undertaken on irrigation system improvements for the meadows. grazing is far preferable to burning. generally respectful of primitive use areas and refrain from littering and damage. less desirable for those who prefer a primitive camping experience. of the reservoir. Redirecting the water for cattle use would be a good idea. Tim noted there are proposals to dredge the pond and cap the archaeological site. grouse conservation, economic benefits to communities and America’s Great Outdoors. the FY2013 request of $1,127,335. this month resulted in the adoption of seven horses and one burro. For the Northern California District, Nancy updated the group on the status of management changes in the Surprise Field Office, and development of conservation strategies for sage grouse west-wide, including involvement of local governments in developing management alternatives. A sage grouse decision to amend land use plans is due by September 2014. Surprise Field Office Management: Nancy told the RAC that Allen Bollschweiler had taken a position in Grants Pass, Oregon, as field manager. For the foreseeable future, she has assigned Tim Burke, Alturas field manager to oversee the Surprise Field Office. Nancy has also asked Tim to assess workload and staffing at the Surprise Field Office as well as the Alturas office and determine if there are ways to achieve efficiencies. John Erquiaga said that this looks like an attempt to close the Cedarville office. Nancy responded that no decisions have been made and that is not a consideration at this point. She said that the BLM is taking this opportunity to see if there are areas where we can share workload or staffing. She also said that Tim would be talking with our partners and the counties about the ongoing work and partnerships and possibilities for future management of the two offices. conservation strategies will result in amendment to the Alturas, Eagle Lake and Surprise resource management plans. Because they were completed in 2008 she said they are in “fairly good shape” regarding conservation of sage grouse habitat. There will likely be some changes, however. meeting. 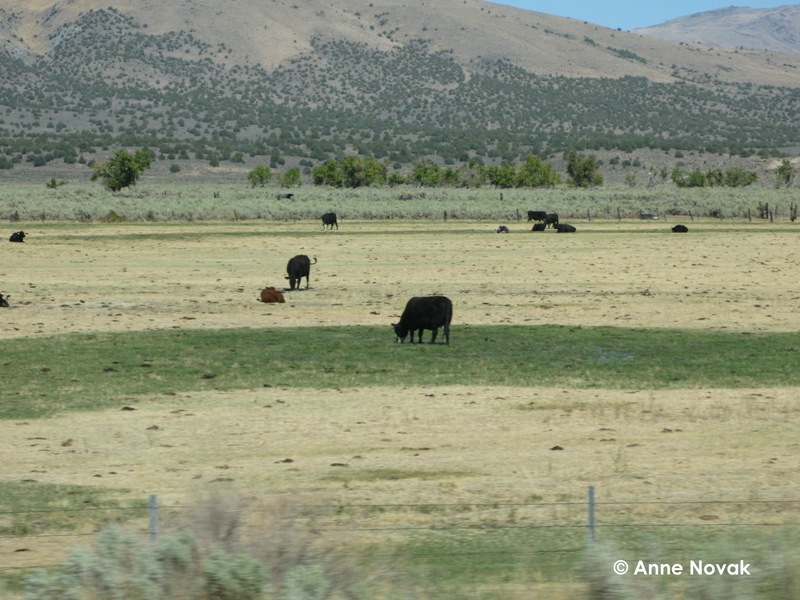 The work is designed to develop quantitative data upon which to base defensible livestock grazing decisions for all three northeast California field offices. resource conditions in wild horse and burro herd management areas. Volunteers will work in the Twin Peaks, High Rock and Nut Mountain HMAs. BLM can help cover volunteer expenses. The volunteer announcement has been posted online at Volunteer.gov, announced through the news media and through other venues. Alan Cain, who represents wild horse and burro interests, said he likes the idea of providing opportunities for people to study range conditions first hand. Volunteers will also have the hance to learn about range effects of horse populations. Upcoming Gathers: Nancy also reported that the Surprise Field Office is working on a range of alternatives in an environmental assessment being prepared for the proposed Coppersmith, Buckhorn and Carter Reservoir gathers. Coppersmith and Buckhorn are anticipated this fall; Carter is proposed for next summer. The environmental assessment will be released soon for public comment. Sean Curtis urged the BLM to consider the ability to help the Modoc National Forest with their plans to gather the Devil’s Garden herd territory. Carol Montgomery suggested that the RAC should receive more information on actions and recommendations of the national Wild Horse and Burro Advisory Board. Public Affairs Officer Jeff Fontana agreed to forward information on web links to current information as it becomes available. Tim Burke updated the council on the history and current status of proposals for geothermal leasing and development in the Medicine Lake Highlands in Siskiyou County. Leases were first issued in the 1970s, and development projects for 49-megawatt power plants at locations called Telephone Flat and Four Mile Hill were approved by the BLM and Forest Service in the 1990s. Subsequent court actions invalidated the leases at the Four Mile Hill project site. The development company, Calpine Corp., is now proposing developing at least one 49-megawatt power plant at the Four Mile Hill project site, and is considering the possibility of developing up to 480 megawatts of geothermal power in the entire Known Geothermal Resource Area (KGRA). The BLM will need to complete new environmental analysis to extended the leases, an action that is required if the company is to pursue development plans. The company has not yet informed the BLM about its preferred course of action. During the previous environmental analysis on proposed developments there was opposition from Native American tribes, environmental groups and a homeowners association at Medicine Lake. There was also support expressed. Legal questions remain about the validity of leasing at the Telephone Flat project site. The item was informational only. The RAC took no action. tribes and settlers clashed. The site contains memorial markers for the six U. S. Cavalry members who died. Mitigation funds from the Reno-Alturas Intertie powerline project were used to buy part of the property and it was donated to the BLM for management. An adjacent parcel is privately owned; BLM is negotiating acquisition. There are mitigation funds still available that could be used. Discussions and negotiations are continuing about possible acquisition, including the possibility of a land exchange. environmental review process has not yet begun. The field office has advised the company about concerns with proposed wind turbine locations within priority sage grouse habitat, where developments must follow BLM’s interim guidance for habitat conservation. BLM has asked the company for an alternative that includes turbine placement outside of grouse habitat to avoid conflicts with interim sage grouse habitat management. The Eagle Lake Field Office also asked the company for more extensive analysis of bald eagle and golden eagle use of the project area to determine possible wind energy impacts on the birds. Another year of analysis could be required. The BLM will not move forward with environmental analysis until the two requirements are met. Bly Tunnel: There is no water flowing from the tunnel. The field office closed a controversial bypass valve last February. There has been no action on five appeals filed with the Interior Board of Land Appeals, including one request for a stay of the BLM action. information from Karen Sussman, president of the International Society for the Protection of Mustangs and Burros, in saying that small herd numbers damage the educational structure wild herd family units and leads to higher than normal reproduction rates. She also recommended that the BLM use more water and bait trapping, particularly for smaller herds, where there is a need to gather excess animals. Carla also summarized a proposal for a special management approach for the Carter Reservoir Herd that roams public land east of Cedarville. She noted these horses have “old world” Spanish markers, making them unique. She was concerned with the low AML currently in place, and said it is important to increase the AML to preserve the line of horses. At a minimum, she said the currently population level of 55 should be maintained. interested in working with Congress to expand ranges. Carla expressed support for cooperation among wild horse interests and livestock operators. Skip Willmore said some of his constituents are concerned that agencies are closing down road access to public lands. Sean Curtis noted that the BLM took a more user friendly approach to travel route designations than did the Forest Service when it established travel route designations in the Alturas, Surprise and Eagle Lake resource management plans. Skip said there are constituent concerns that closures would extend to BLM-managed lands. Managers said there are no efforts underway to expand route designations beyond those contained in the resource management plans. There was discussion about management of public lands that are surrounded by private lands, and processes that can be used to address the issue. Managers said the process differs by location and access issues are addressed on a case by case basis. In some cases, the BLM negotiates for public access to isolated parcels. They can also be designated for disposal from public ownership or retained for various natural resource values. The RAC reviewed the BLM’s draft national socioeconomic strategy developed earlier this year. Members received copies in advance. Nancy Haug summarized that BLM capability in socioeconomic analysis has declined over the years, while need for the analysis has become increasingly important. This draft strategy is recognition of this, and an attempt by the BLM to increase capability in analyzing socio economic effects of its land management decisions. communities to make the case for the importance of commodity based programs. Louise Jensen: There has to be flexibility to customize this for local communities. That layering to create a local toolbox for socioeconomic analysis does not appear to exist here. There is no good modeling to measure unintended consequences of an action. The BLM needs to have control over the modeling and the data that are used. It would be important that all field offices used the same standards for modeling and data analysis. The data collected has to be easily used by staff. Frank Bayham: Good socioeconomic information is important in BLM decision making He was concerned that this document is a prelude to restructuring of the BLM in some way, positioning political and economic considerations above other needs and thus impacting the agency’s natural resource expertise and capability on the ground. It appears this could become a major entity within the BLM. There is value in some of the information addressed in the document. He said expertise is sometimes needed to gather the correct information in the correct way to be most useful in an agency decision making process. In principle he supports the document, but feels it is too loaded with unnecessary specifics. Judy Oliver: She feels the BLM is doing socio-economic work already, but doesn’t doubt more data could be used. She suggested there are outside sources of information and data collection, such as universities. She sees this as a response to BLM’s need to address increasing competition for rangeland use and resources. Jack Razzeto: Jack questioned whether the socioeconomic data will really affect the agency decision making process. Ken McGarva: It will cost money to hire people to study the topic and there is no money to take care of what we have now. This looks like a plan to spend more money. Skip Willmore: The BLM appears to be “fishing” to so something it does not need to do. There is BLM expertise on the ground to answer the socioeconomic questions. cryptic which obfuscates the intent. An example: Some of the tools referenced might not even exist yet. strategies prior to the narrative being developed. exercise seems premature until there is a standard. most of the proposed actions. Specific actions in strategy 2.2 are one example. evaluate the effectiveness of the proposed actions. –The RAC had difficulty prioritizing proposed actions because of the notes listed above. Comments/Questions: Tim said he will bring RAC comments on the Boulder Reservoir proposal back to the staff for consideration. For example, he will reflect support for the buck and pole fencing and dredging proposals. He will ensure that the RAC receives a copy of the decision. Topics Status report on Bly Tunnel, status of Horse Lake Wind proposal, status of sage grouse conservation strategy, updates on proposed wild horse gathers in the Surprise Field Office, update on management of Surprise Field Office, status of Alturas Field Office PG&E lands acquisition, status of Medicine Lake geothermal development proposals, update on Homecamp decision/Boulder Reservoir project.